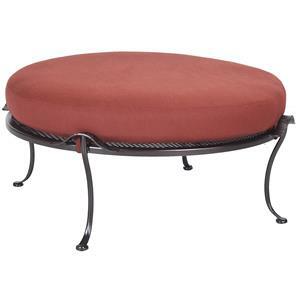 A great addition to your outdoor furniture, this round ottoman is sure to enhance your relaxing experience outdoors. The 8" high cushion provides plenty of padding so you can either sit on the ottoman or set it next to a chair and throw your feet up on it. Small handles located by the joint of the legs make it easy to grab the ottoman so you can move it around to different locations. Pair it with a crescent shaped loveseat or sectional to create a complete look. 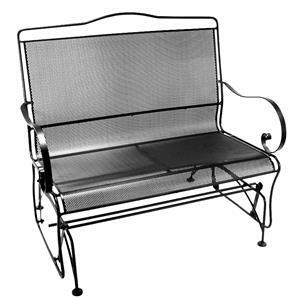 Relax in the summer sun as you put your feet up and enjoy a nap on a lazy Sunday with the addition of this elegant adjustable chaise lounge to your outdoor space. 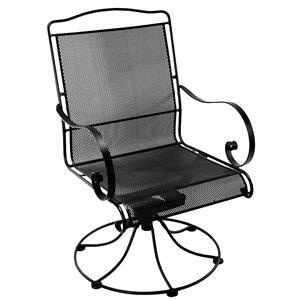 The adjustable base makes it easy to find the right angle for perfect relaxation. Elegant curved arms and arched back combine with the option to choose your finish for a one of a kind look. Stylish and functional, you will love having summer parties outdoors with this elegant chair in your patio retreat. The arched back and curved, stylish arms combine with the swivel rocker base for a look that is not only handsome, but functional. Designed out of hand forged wrought aluminum and available in multiple finishes, you will love having this piece in your backyard retreat. Casually enjoy the outdoors with this bar height bar stool. 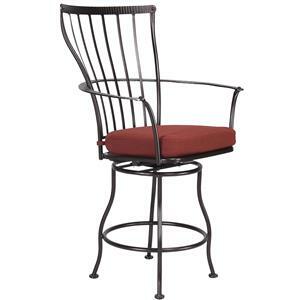 Sit back against the supportive slat back and rest your arms are on the uniquely embossed iron arms of the bar stool. The swivel base gives you the freedom to quickly change direction while the seat cushion makes sure that your bottom rests with ease. 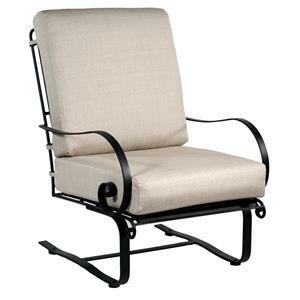 Handsomely designed and the perfect addition to your outdoor retreat, glide and relax the day away in comfort when you add this piece to your back yard. Elegant curved arms and an arched back make this piece the one you have been searching for. Choose your finish from a variety of choices to create a look you will love. 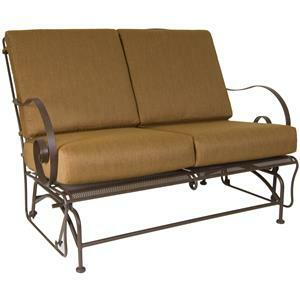 Glide your way into utter relaxation with this handsome settee on your patio. Elegant arched back and curved arms gives this piece the look you have been craving. Choose from a variety of finishes to create a piece that is unique to your home. 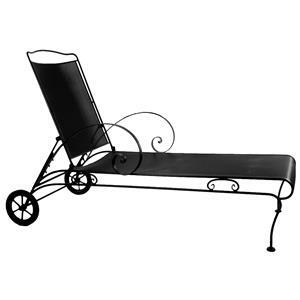 Relax and lean back as you soak in the sun with this stylish lounge chair. The spring base makes it easy to kick back and unwind after a long day at work as you relax in your yard. Curved arms add a laid back feel to the plush seat and seat back that wont go understated. Multiple finishes are available so you can find the look ideal for you. 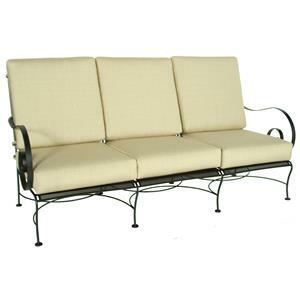 Cuddle up with your loved one as you watch the night sky on your patio with this lovely glider love seat. Stylish curved arms and arched back combine with the plush sat and seat back for a look and feel you will love. Choose from a variety of finishes to create a one of a kind look ideal for your home. Stylish and unique, liven up your outdoor space with this comfy sofa. Curved arms, arched back, and elegant leg design will have you head over heels for this piece. 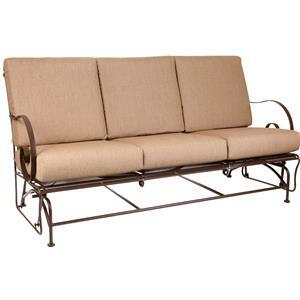 Choose from a variety of finishes to make this sofa unique to your back yard. Relax and unwind atop the plush seat and seat back for the perfect end to your day. 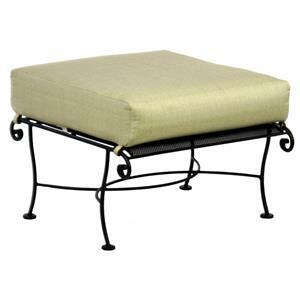 Stylishly unique and perfect for your outdoor space, complete your patio set with this handsome ottoman. Elegant curves create a flow that wont go understated. Kick your feet up atop the plush pad for the perfect place to unwind after a long day. Choose your finish from multiple options to create a one of a kind look that suits your style perfectly.